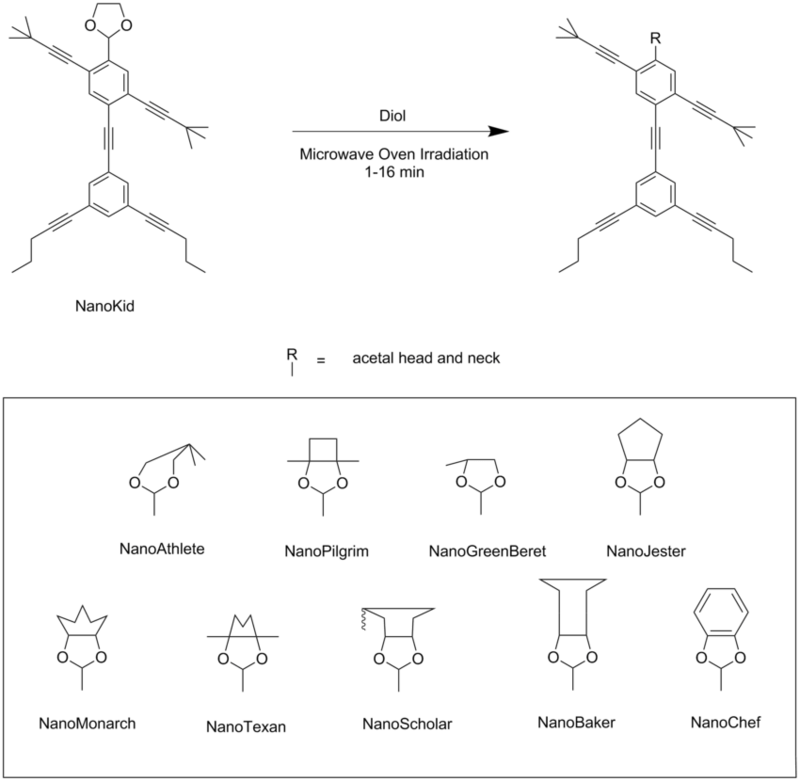 NanoPutians are a series of organic molecules whose structural formulae resemble human forms. James Tour et al. (Rice University) designed and synthesized these compounds in 2003 as a part of a sequence of chemical education for young students. The compounds consist of two benzene rings connected via a few carbon atoms as the body, four acetylene units each carrying an alkyl group at their ends which represents the hands and legs, and a 1,3-dioxolane ring as the head. Tour and his team at Rice University used the NanoPutians in their NanoKids educational outreach program. The goal of this program was to educate children in the sciences in an effective and enjoyable manner. They have made several videos featuring the NanoPutians as anthropomorphic animated characters. Construction of the structures depends on Sonogashira coupling and other synthetic techniques. By replacing the 1,3-dioxolane group with an appropriate ring structure, various other types of putians have been synthesized, e.g. NanoAthlete, NanoPilgrim, and NanoGreenBeret. Placing thiol functional groups at the leg enables them to “stand” on a gold surface. “NanoPutian” is a portmanteau of nanometer, a unit of length commonly used to measure chemical compounds, and lilliputian, a fictional population of humans in the novel Gulliver’s Travels. To accomplish these goals, several video clips, CDs, as well as interactive computer programs were created. Tour and his team invested over $250,000 into their project. In order to raise the funds for this endeavor, Tour used unrestricted funds from his professorship and small grants from Rice University, the Welch Foundation, the nanotech firm Zyvex, and Texas A&M University. Tour also received $100,000 in 2002 from the Small Grants for Exploratory Research program, a division of the National Science Foundation. The main characters in the videos are animated versions of the NanoKid. They star in several videos and explain various scientific concepts, such as the periodic table, DNA, and covalent bonding. Rice conducted several studies into the effectiveness of using the NanoKids materials. These studies found mostly positive results for the use of the NanoKids in the classroom. A 2004-2005 study in two schools districts in Ohio and Kentucky found that using NanoKids led to a 10-59% increase in understanding of the material presented. Additionally, it was found that 82% of students found that NanoKids made learning science more interesting. To create the first NanoPutian, dubbed the NanoKid, 1,4-dibromobenzene was iodinated in sulfuric acid. To this product, “arms”, or 3,3-Dimethylbutyne, were then added through Sonogashira coupling. 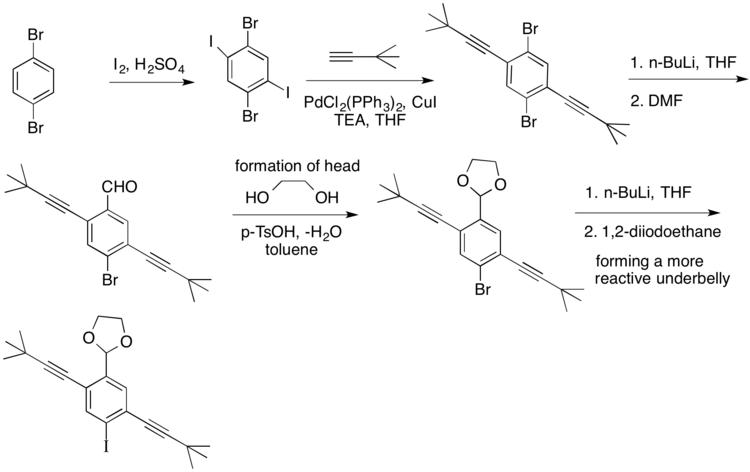 Formylation of this structure was then achieved through using the organolithium reagent n-butyllithium followed by quenching with N,N-dimethylformamide (DMF) to create the aldehyde. 1,2-Ethanediol was added to this structure to protect the aldehyde using p-toluenesulfonic acid as a catalyst. Originally, Chanteau and Tour aimed to couple this structure with alkynes, but this resulted in very low yields of the desired products. To remedy this, the bromide was replaced withiodide through lithium-halogen exchange and quenching by using 1,2-diiodoethane. This created the final structure of the upper body for the NanoKid. The synthesis of NanoPutian’s lower body begins with nitroaniline as a starting material. Addition of Br2 in acetic acid places two equivalents of bromine on the benzene ring. NH2 is an electron donating group, and NO2 is an electron withdrawing group, which both direct bromination to the meta position relative to the NO2 substituent. Addition of [[NaNO2]], [[H2SO4]], and EtOH removes the NH2¬ substituent. The Lewis acid SnCl2, a reducing agent in THF/EtOH solvent, replaces NO2 with NH2, which is subsequently replaced by iodine upon the addition of NaNO2, H2SO4, and KI to yield 3,5-dibromoiodobenzene. In this step, the Sandmeyer reaction converts the primary amino group (NH2) to a diazonium leaving group (N2), which is subsequently replaced by iodine. Iodine serves as an excellent coupling partner for the attachment of the stomach, which is executed through Sonogashira coupling with trimethylsilylacetylene to yield 3,5-dibromo(trimethylsilylethynyl)benzene. Attachment of the legs replaces the Br substituents with 1-pentyne through another Sonogashira coupling to produce 3,5-(1′-Pentynyl)-1-(trimethylsilylethynyl) benzene. 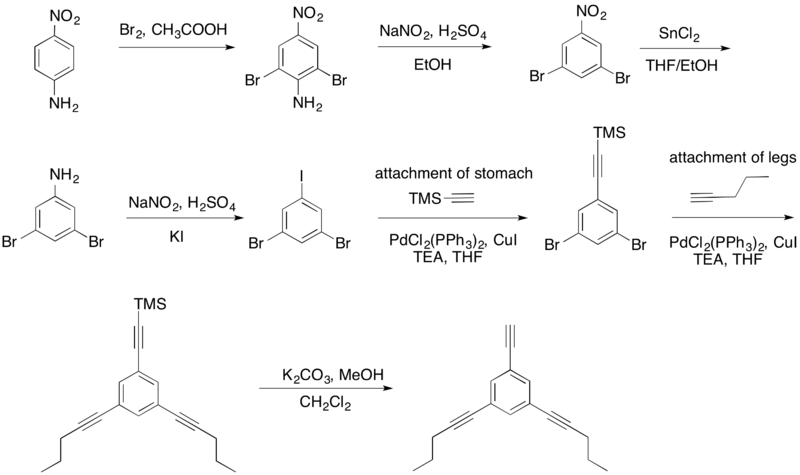 To complete the synthesis of the lower body, the TMS protecting group is removed by selective deprotection through the addition of K2CO3, MeOH, and CH2Cl2 to yield 3,5-(1′-Pentynyl)-1-ethynylbenzene. To attach the upper body of the NanoKid to the lower body, the two components were added to a solution of bis(triphenylphosphine)palladium(II) dichloride, copper(I) iodide,TEA, and THF. This resulted in the final structure of the NanoKid. The series of NanoProfessionals were created using the NanoKid as the starting material. This was done by adding an excess amount of a 1,2- or 1,3- diol to the NanoKid in the presence of a catalytic amount of p-toluenesulfonic acid and microwave oven-irradiation. The use of microwave irradiation reduced the reaction times. These reactions resulted in an acetal exchange, which changed the structure of the head of the NanoKid to create the different head structures of the NanoProfessionals, which include: NanoAthlete, NanoPilgrim, NanoGreenBeret, NanoJester, NanoMonarch, NanoTexan, NanoScholar, NanoBaker, and NanoChef. By creating a series of different figures, the ultimate product was a recognizably diverse population of NanoPutians. Although the majority of the figures are depicted in their equilibrium conformations, some of the NanoPutians include nonequilibrium conformations in order to make them more recognizable to nonchemists. Many liberties were taken in the visual depiction of the head dressings of the NanoPutians. The entire population of NanoPutians (with the exception of the NanoChef) were generated in one microwave oven reaction and confirmed by mass spectrometry and 1HNMR. Below is a table listing the diols needed to convert the NanoKid into various NanoProfessionals. The diols used to create NanoPilgrim and NanoTexan were made through reductive pinacol coupling of the 1,4- and 1,5-diketones with SmI2 and Mg/TiCl4. To create the diols used to make the NanoMonarch and the NanoScholar, catalytic OsO4 was used to dihydroxylate the respective cycloalkenes. The diastereomeric ratios were determined through 1H NMR using the diastereotopic acetal protons. 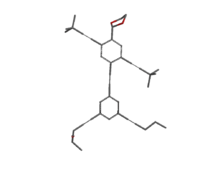 Stick Figure NanoPutian in its Energy Minimized Conformation. Determined Using Spartan. 3-Butyn-1-ol was reacted with methanesulfonyl chloride and triethanolamine to produce its mesylate. The mesylate was displaced to make thiolacetate. The thiol was coupled with 3,5-dibromo(trimethylsilylethynyl)benzene to create a free alkyne. The resulting product, 3,5-(4’-thiolacetyl-1’-butynyl)-1-(trimethylsilylethynyl)-benzene, had its trimethylsilyl group removed using tetra-n-butylammonium fluoride (TBAF) and AcOH/Ac2O in THF. The free alkyne was then coupled with the upper body product from the earlier synthesis. This resulted in a NanoKid with protected thiol feet. To make the NanoKid “stand’, the acetyl protecting groups were removed through the use of ammonium hydroxide in THF to create the free thiols. A gold-plated substrate was then dipped into the solution and incubated for four days. Ellipsometry was used to determine the resulting thickness of the compound, and it was determined that the NanoKid was upright on the substrate. Synthesis of the upper part of the NanoPutian chain begins with 1,3-dibromo-2,4-diiodobenzene as the starting material. Sonogashira coupling with 4-oxytrimethylsilylbut-1-yne produces 2,5-bis(4-tert-butyldimethylsiloxy-1′-butynyl)-1,4-di-bromobenzene. One of the bromine substituents is converted to an aldehyde through an SN2 reaction with the strong base, n-BuLi, and THF in the aprotic polar solvent, DMF to produce 2,5-bis(4-tert-butyldimethylsiloxy-1′-butynyl)-4-bromobenzaldehyde. Another Sonogashira coupling with 3,5-(1′-Pentynyl)-1-ethynylbenzene attaches the lower body of the NanoPutian. The conversion of the aldehyde group to a diether “head” occurs in two steps. The first step involves addition of ethylene glycol and trimethylsilyl chloride (TMSCl) in CH2Cl2 solvent. Addition of TBAF in THF solvent removes the silyl protecting group. ^ “Welcome to Nanokids.” Accessed May 6, 2013. http://nanokids.rice.edu/. ^ “C&EN: EDUCATION – ‘NANOKIDS’ TRY TO GET INTO MIDDLE SCHOOL.” Accessed May 10, 2013. http://pubs.acs.org/cen/education/8214/8214nanokids.html. ^ “NanoKids – Mission.” Accessed May 6, 2013. http://cohesion.rice.edu/naturalsciences/nanokids/mission.cfm?doc_id=3039. In 2003, there was a paper published which looked like it was going to be a good candidate for the Ig Nobel Prize. It was “Synthesis of Anthropomorphic Molecules: The NanoPutians” by Professor James Tour, a chemistry professor at Rice University’s Institute for Nanoscale Science and Technology. The word “NanoPutian” is a portmanteau of “nano”, which means a billionth and the “Lilliputian” from the novel Gulliver’s Travels. The Tour group designed and synthesized a number of human-shaped organic molecules in this paper. Shown in Figure 1 is a molecule named NanoKid, which was chosen by the group as a basic skeleton. The 3-D model looks like the figure on the right and the structural formula used by chemists is shown on the left. The structural formula might look more human, since the oxygen atoms look kind of like the eyes. The functional group used for the head part of NanoKid is called acetal. This group is easily exchangeable to make NanoPutians of various occupations (Figure 2). Let’s not be too picky about the bond angles of NanoMonarch and NanoTexan. Unfortunately, NanoBalletDancer seems to be the only one having a different posture (Figure 3). Personally, I would be interested in making NanoPitcher or NanoGermanSuplex! 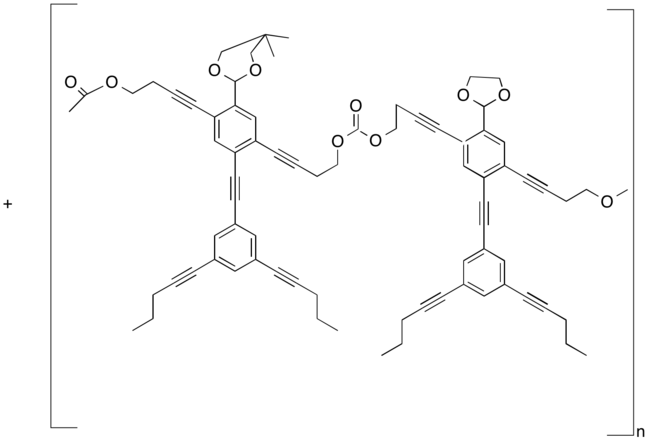 The Tour Group also synthesized NanoPutians standing on gold surface with thiol functional groups on their feet, a NanoPutian couple dancing (Figure 4), and even a polymer of NanoPutians (Figure 5). 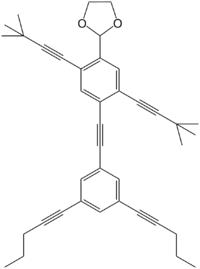 NanoPutians aren’t actually the first example of human-shaped molecule. For example, the molecule shown in Figure 6 has appeared as a joke in a journal published on April Fool’s Day. 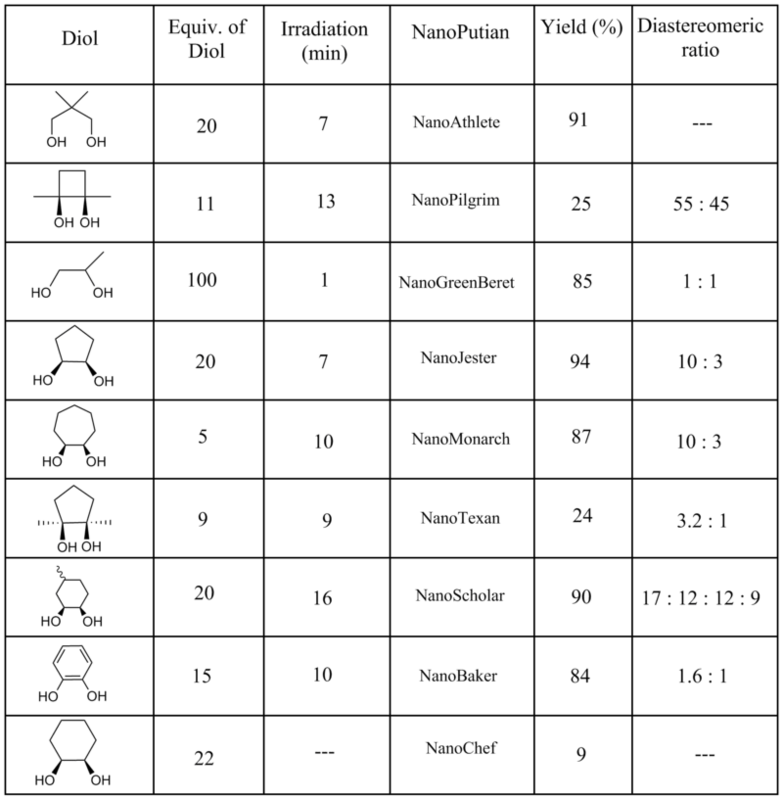 The molecule shown in Figure 7 has been introduced once as Buddha molecule. Nevertheless, NanoPutians were probably the first case where human-shaped molecules were synthesized systematically(?) to be published as a full paper. Besides being human-shaped, the NanoPutian molecules have neither notable properties nor potential usefulness for future. The synthesis is also too straightforward to make any significant methodological contribution to chemical science. Then how did this research get funded and get to be published on Journal of Organic Chemistry? It turns out that the synthesis was a part of the chemistry education program at Rice University aimed at introducing nanotechnology to young students. In fact, it has also been on the cover page of Journal of Chemical Education too. It’s funny though, to imagine the faces of the journal editors when they first read the paper. 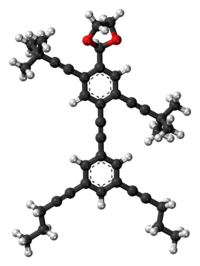 But come to think of it, molecules like dodecahedrane and kekulene might not be so different in terms of not having much to appeal other than their structural beauty. Even “total synthesis of biologically active natural products”, the most respected subfield of organic chemistry, has been criticized on its meaning recently. In a way, the NanoPutian research seems to me as a voice saying “synthetic targets should be selected more freely” and almost as an antithesis against the state of organic chemistry today. Anyway, this paper was introduced by general media and was also one of the topics that received most feedbacks on my homepage. There were those who dismissed it as a meaningless play by chemists, but in terms of directing public interest toward organic chemistry wasn’t it a hundred times more effective than ordinary researches? 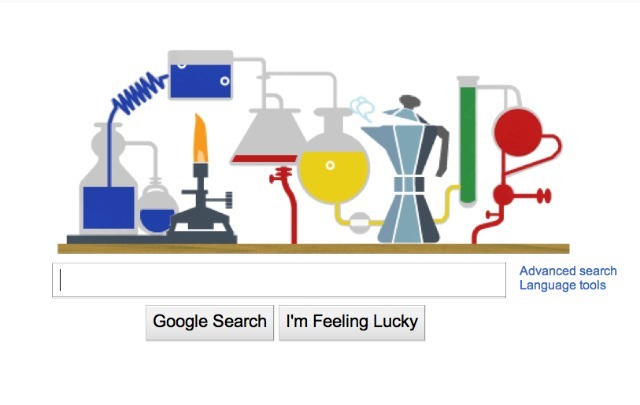 I think it was an excellent work for the education of young chemists as well. Professor Tour’s playful sense of molecular design can be seen in his research of NanoCars too, which I will introduce in a separate column. This is a wonderful work which can impress both serious scientists and general public.